Welcome to the Week 11 Quarterback Rankings! This is a brutal week for setting lineups in deep leagues. The Cooper Kupp injury has really hurt yours truly this week. What a tough break for the Rams and for their young receiver. Hopefully Kupp will have a strong recovery in 2019, because he’s been a joy to watch. Obviously, we’re all feeling the deep cut of a six team bye week. The QB losses aren’t that brutal, but the skill positions are a different story as we’ll see later. In DFF this week, I have my eyes on the big games. Wentz and Brees are the early leaders to be on my core team for Week 11. I’m looking forward to the DFF pod this week after surviving last week’s tight pricing. I hope most of you did as well. I’ll be back in a bit with the receivers, backs and tight ends. 1 Patrick Mahomes KC 7.100 KC@LAR 11/19/2018 08:15PM ET The implied point total on the game is 63.5, which is just insane. 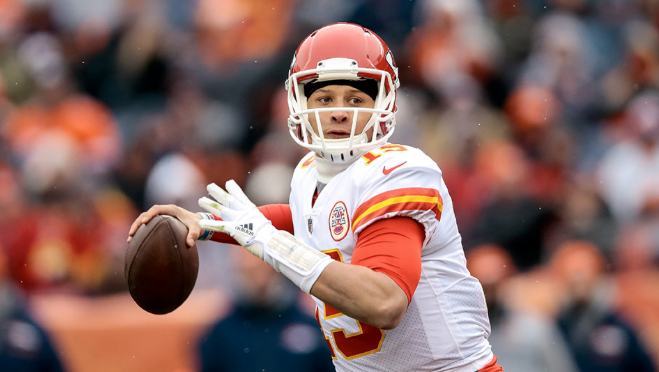 Mahomes is a great play in seasonal and worthy of consideration in DFF despite his top shelf price tag. 2 Drew Brees NO 6.500 PHI@NO 11/18/2018 04:25PM ET He’s at home in a throw-to-win matchup. The key will be getting Kamara off through the air. If that happens, I think he has a big day. 3 Carson Wentz PHI 6.300 PHI@NO 11/18/2018 04:25PM ET The Eagles need this one and they can certainly get it done if they execute and have a smart game plan. I see no reason why they’d be anything other than pass heavy in this game. The Saints are legit good defending the run and can be beaten through the air. Meanwhile, the Eagles’ strength is Wentz and his receivers. This is a good week to bet on them. The obvious stack play is Ertz, but he’ll cost you. 4 Jared Goff LAR 6.400 KC@LAR 11/19/2018 08:15PM ET They will be pushed and they should be able to do plenty of damage against this defense. He feels like a guy with floor and ceiling this week. 5 Cam Newton CAR 6.200 CAR@DET 11/18/2018 01:00PM ET It’s hard to see him failing in this spot. 6 Andrew Luck IND 5.900 TEN@IND 11/18/2018 01:00PM ET He’s rolling and he’s a good bet to keep it going at home versus a beatable defense. Not to say that the Titans are a pushover. They showed us last week that they’re not, but they can be had. Hilton has a tough matchup so I’m still mulling how I’d want to stack with Luck. 7 Matt Ryan ATL 6.100 DAL@ATL 11/18/2018 01:00PM ET He seems like a safe play here. Dallas could disupt with the pass rush, but overall I like Ryan. 8 Ryan Fitzpatrick TB 5.600 TB@NYG 11/18/2018 01:00PM ET Volume, kids. Tampa plays fast and pass heavy. If Godwin sits, then D-Jax becomes a very interesting stacking piece. 9 Philip Rivers LAC 6.000 DEN@LAC 11/18/2018 04:05PM ET He’ll need to use the backs in the pass game here, but he’s like a Zen master throwing to the backs, so that’s no concern. A Rivers/Gordon stack has merit here. 10 Deshaun Watson HOU 5.700 HOU@WAS 11/18/2018 01:00PM ET Tough matchup through the air but he’s a dual threat so no reason to go away from him. 11 Mitchell Trubisky CHI 5.700 MIN@CHI 11/18/2018 08:20PM ET Tough matchup but having a deep offense works for them here. A good week to bet on Burton, Gabriel or Cohen if you are stacking. 12 Ben Roethlisberger PIT 5.800 PIT@JAX 11/18/2018 01:00PM ET Obviously a tough matchup, but he’s playing well. 13 Kirk Cousins MIN 5.600 MIN@CHI 11/18/2018 08:20PM ET Tough matchup, but he’ll be fine as long as Thielen is good to go. 14 Dak Prescott DAL 5.200 DAL@ATL 11/18/2018 01:00PM ET Tough to get a total handle on Dak right now as he’s playing with two new receivers in Cooper and Gallup, but we know the situation is improving. His running ability gives him a floor to work from. 15 Marcus Mariota TEN 5.500 TEN@IND 11/18/2018 01:00PM ET Looking better as we figured he eventually would. Solid matchup this week. Now we just need to get Sharpe and Taywan Taylor fully healthy. 16 Eli Manning NYG 5.200 TB@NYG 11/18/2018 01:00PM ET He’s viable in this matchup. Having all of the big four weapons healthy helps too. 17 Blake Bortles JAX 5.100 PIT@JAX 11/18/2018 01:00PM ET He’s volatile so you never know, but best to avoid him and his team’s run-heavy desires. 18 Case Keenum DEN 4.800 DEN@LAC 11/18/2018 04:05PM ET Not a good matchup. 19 Josh Rosen ARI 4.800 OAK@ARI 11/18/2018 04:05PM ET Showing some signs and this matchup is a good one. 20 Matthew Stafford DET 5.400 CAR@DET 11/18/2018 01:00PM ET Volume is down. Tate is gone. Marvin Jones is banged up and may miss Week 11. Stafford is a sub optimal play. 21 Andy Dalton CIN 5.000 CIN@BAL 11/18/2018 01:00PM ET This offense flows from AJ Green and this is a tough matchup. Downgrade Dalton for now. 22 Lamar Jackson BAL 4.700 CIN@BAL 11/18/2018 01:00PM ET I want to push him up the board BUT the Ravens are being coy about how this is going to shake out. Flacco could play and RGIII could be a factor if Flacco is out. My hope is that Jackson is the man and takes this thing over, but who knows. If he plays the whole game, he could post big fantasy digits. The bottom line is that I just want to watch if he plays. A new era in Baltimore is overdue. ***UPDATE*** Flacco is now all but ruled out. Still, we don’t know if RGIII is a factor so be careful with Jackson. If you want to give him a whilr in a GPP, that’s fine, but understand the risks. 23 Alex Smith WAS 4.800 HOU@WAS 11/18/2018 01:00PM ET Their offense is not designed to help your fantasy team. Additionally, their weapons are way banged up. 24 Derek Carr OAK 4.700 OAK@ARI 11/18/2018 04:05PM ET No weapons. No thanks. 25 Joe Flacco BAL 5.300 CIN@BAL 11/18/2018 01:00PM ET Questionable—in more than one way. He has a hip injury that could keep him out this week. 26 Robert Griffin III BAL 4.700 CIN@BAL 11/18/2018 01:00PM ET Not a viable option, if he plays, due to in-game replacement possibilities. 27 Russell Wilson SEA 5.800 GB@SEA 11/15/2018 08:20PM ET (ALREADY PLAYED) He’s playing at a high level and they need this one badly. Wilson showed renewed inclination to use his wheels last week. My gut is telling me that he’s going to continue the trend. His rushing usage has increased each week over the last three games—peaking at 9 rushes for 92 yards in Week 10. Russ is going to do whatever is takes and he looks good running right now. Vintage Wilson. 28 Aaron Rodgers GB 5.900 GB@SEA 11/15/2018 08:20PM ET (ALREADY PLAYED) This is a huge game and Seattle should make it competitive throughout. You have a good shot at four quarters of Rodgers in this one.